Spencer Tracy (Inherit The Wind) plays John J. Macreedy, a one-armed World War II veteran who arrives at the small town of Black Rock. The town is controlled by wealthy Reno Smith (Robert Ryan, Crossfire) and his men. Smith makes clear to Macreedy that he is not welcomed. Macreedy goes about his business unaware that the residents of Black Rock harbor a dark secret. MGM’s Bad Day at Black Rock is a superb little suspense movie, a great example of ’50s noir, tightly written by Millard Kaufman, and brilliantly directed by John Sturges (The Magnificent Seven and The Great Escape). The film’s premise is simple, but one has to admire how well Sturges plays with the concept. It’s a terrific exercise in minimalism, relying on basic storytelling techniques in order to tell the story. It’s also a very visual film. Sturges uses wide angels and empty spaces like a true master of the medium. Actually, I’ve always found odd that such a small-scale production relies so much on the visual glories of CinemaScope, but the experiment works beautifully. The film is packed, I mean packed, with all kinds of interesting ideas. Firstly, Bad Day at Black Rock is one of the first American movies to talk about the Japanese-Americans internment camps. The movie also touches upon other controversial issues like xenophobia, ruralism versus urbanism, and patriotism. The film’s biggest irony is that in attempt to preserve what is perceived as true American values, the residents of the town turned their home into a fascist state. All these ideas are neatly compressed into eighty-one short minutes. The cast is wonderful. Lee Marvin (Cat Ballou), Dean Jagger (Elmer Gantry), Walter Brennan (The Westerner), and Ernest Borgnine (Marty) play a rabble of assorted townfolks. Spencer Tracy walks, however, away with the movie — his naturalistic style has never been better displayed. It’s in fact my favorite performance of his — it’s hard to find another actor that does as much without moving an eyebrow. Not surprising, Sturges, Tracy and Kaufman received well-deserved Oscar nominations for their work here (Tracy also won the top award at the prestigious Cannes Film Festival). Anne Francis (Forbidden Planet) plays the only female role in the film. William C. Mellor’s (A Place in the Sun and Peyton Place) cinematography is fantastic too. 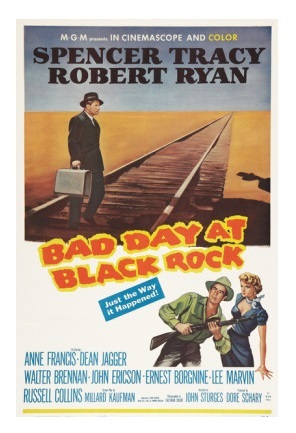 Bad Day at Black Rock is one of the great thrillers of the 1950s — a powerful movie that I highly recommend! Color, 81 minutes, Not Rated. Why haven’t I seen this? It looks GREAT. So glad you reviewed it. I would rent it just to the casting ensemble. I’m confident you will enjoy it. I look forward to your review! Excellent critique. You summed up the movie’s virtues perfectly. Spencer Tracy was a wonderful actor, I can’t think of a performance by him that I didn’t love. The fight scene with Borgnine is almost surreal, but absolutely brutal. Yes, Tracy’s sereness dominates the entire film. Few actors have his type of effortless brilliance.